On 3 February at Artashat city a council meeting of RPA Ararat territorial organization was held. 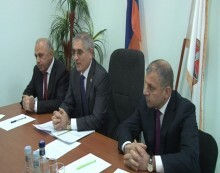 The meeting was attended by the Member of RPA Executive Body, the Chairman of RPA Organizational Committee Ruben Tadevosyan, the Governor of Ararat A. Grigoryan. The agenda included the elections to the Chairman of RPA Ararat territorial organization. Alik Sargsyan was unanimously elected the Chairman of the Council of RPA Ararat territorial organization. Discussions were held at the course of the meeting. The members of the council of RPA Ararat territorial organization confirmed that RPA Ararat territorial organization will be one of the best organizations of RPA and will fulfill assigned tasks with honor.